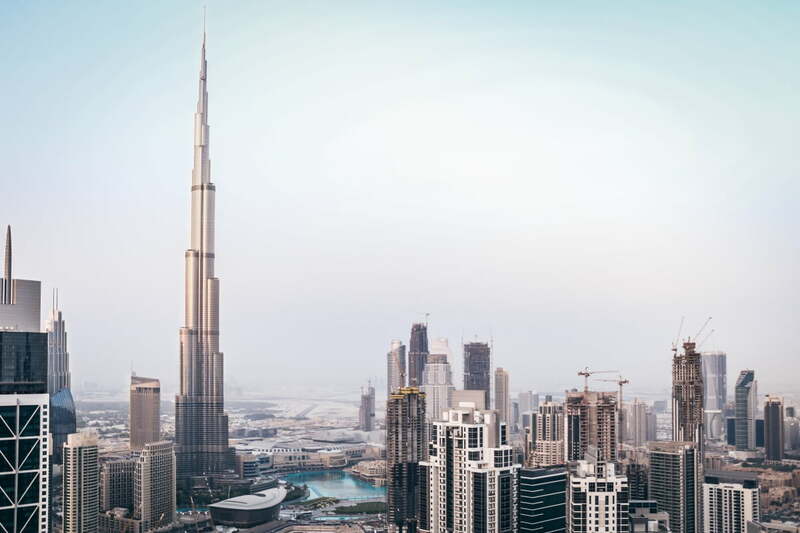 When you visit Dubai for the first time, you’ll likely feel overwhelmed by the uber-tall skyscrapers and the endless highways. The city has no ‘countryside’, only the desert. So it’s basically the huge urban metropolis, bordered by the desert and the Persian Gulf. It’s a good idea to read up on how to survive in Dubai, how to conduct yourself and so on before you travel to Dubai. Here’s a simple travel guide for first-time travelers to Dubai, where we’ve pooled our expertise and experience to be of assistance to you. Dubai is not a foot-friendly city. Even though you can bicycle along special paths on the Sheikh Zayed Road, you’re better off considering faster transport options. Check with your hotel if it has a free airport-to-hotel shuttle. If you have very less luggage, the Metro is a good way to get to your hotel. During rush hour, between 7 am to 10 am and 4.30 pm to 8 pm, traffic grinds to a halt and metros are full. On Fridays and Saturdays, roads are clogged as well, especially those close to family attractions. Plan your activities accordingly. Purchase a Nol Card for use on the metro, local bus, tram or water bus. If you’re staying for a week or later, pick up the Nol Silver Pass. If you’re in Dubai on a short layover, the rechargeable Nol Red Ticket will do. Download the local Road and Transport Authority (RTA) app S’hail, which offers all the local transport options in one platform. You can explore the following areas on foot: Dubai Marina, City Walk, Bur Dubai, Al Seef, and Deira. Do not stand in areas marked red in public buses. If you fail to pay the due tariff for the entire trip, you can be fined heavily. Chewing gum, drinking water, snacking and sleeping on buses is strictly prohibited. Check the card reader for balance on your Nol card before swiping on the bus. If you’re asked to get off the bus for some reason, refusing to do so can land you a hefty fine. When you’re stepping out of the bus, be sure to flash your Nol card at the reader to check out. If you don’t do this, you’ll be charged more for the journey. If you don’t have the funds to pay fines on public transport, the RTA can confiscate your Emirates ID or your Driver’s License and return it when you pay the fine. Note that two cars are set aside for women and children on all metros. Men sitting in these cars will be fined. Where you want to stay depends on your budget and your needs. If you want to be close to public beaches, stay at the Hilton. Then there’s the Regent Beach hotel, another option or easy access to public beaches. The Four Points Sheraton on Sheikh Zayed Road, Jumeirah Rotana (Satwa), Rydges Plaza (Satwa), Holiday (Al Barsha), Corp Executive Apartments (Al Barsha) and Park Regis Kris Kin (Bur Dubai) are other reasonable hotels with good access to family attractions. Dubai also has plenty of hostels, and Airbnb stays that are perfect for budget travel. Public displays of affection are not tolerated; it can lead to fines or imprisonment. Dubai frowns on public brawls and undignified behavior in public. Women must wear loose-fitting clothes that cover their body. Skin shows, transparent clothing, and shorts in public are not allowed. Beachwear should be restricted only to beaches. Do not drink alcoholic drinks in public. Also, do not drink even a drop before you drive, to avoid fines or imprisonment. The great thing about Dubai is that the city is a foodie paradise. You can enjoy any world cuisine here. The best and the cheapest places to eat are the mall eateries. The next best would be the restaurants in Downtown Dubai and near the Dubai Marina, offering cuisines from different parts of the world. If you want to break the bank, then enjoy a fine dining atmosphere at Indego by Vineet or the At.Mosphere Hotel in the Burj Khalifa, or even a restaurant within the Burj al Arab. As a first-time visitor to Dubai, you’ll want to get an idea of the city’s culture and history and check out its major landmarks. Burj Khalifa: Most first-time visitors to Dubai head straight to the majestic Burj Khalifa. The stupendous structure with its incredible view of the entire city from its observatory deck is a must-see. Dubai Mall: The Dubai Mall, is a mega shopping mall with more than 1200 plus retail outlets. The mall has 150 plus eateries, a 22-cinema multiplex, the incredible VR Park, a Ski Rink, and the incredible Dubai Aquarium. Dubai Creek: The Dubai Creek is the oldest part of Dubai. It was used as a trading and smuggling route in the olden days. Today the Dubai Creek is a bustling business area, lined on both sides by incredible skyscrapers. On one side of the Creek is Bur Dubai with spice and gold souqs. On the other side is Deira with perfume and textile souqs. The Al Fahidi Historical Neighbourhood, Dubai’s oldest part, is located on the Bur Dubai side. The Palm Islands: Take the monorail from the mainland to the incredible manmade Palm Islands. Feast your eyes on the iconic Burj al Arab and the magnificent Atlantis The Palm hotels. Enjoy the incredible rides at the Aquaventure Waterpark. You’ll need an entire day to truly appreciate the Palm Islands. Dubai Garden Glow: This incredible theme park is open only from November 2018 to April 2019. Dubai Garden Glow comprises of a Dinosaur Park, with 100 animatronic dinosaurs growling and moving. Then there’s the Ice Park, with incredible sculptures made of ice. The last is the Glow Garden with beautiful art installations created out of yards of luminous fabric, 1000s of bottles and CDs. About 150 artists from different countries have come together to make this park a reality. Desert Safari: The Dubai desert is a mysterious landscape of sand dunes, wadis and an old way of life. On a desert safari, you can enjoy various desert sports, and experience this ancient landscape to the fullest. You’ll love the desert safari so much, it’s well worth your visit to Dubai just on its own. Apart from the above attractions, if you have the time, check out the incredible Dubai Frame, IMG Worlds of Adventure, the Dubai Aquarium and Dubai Dolphinarium. If your visit is short, visit the attractions that you most want to see and make a list of the things you want to see and experience on your next trip. Disclaimer – This article was submitted to us by Neha Singh, who is a full-time travel blogger and writes for various publications. You can check her work on her website here.